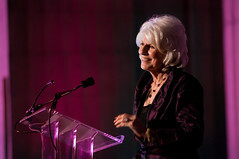 Last night I had the privilege of photographing a private event for NPR, celebrating 30 years of the Diane Rehm Show. BizBash was my client, and they wasted no time in posting their story. I love seeing my photos get put to use so quickly! Relatively speaking it was a simple event, so I had to get a little creative at times. I wandered back into the kitchen, up on the balcony, and just about anywhere else I could find an interesting shot. As usual, you can find some of my favorites here. What a great shoot, Stephen! Awesome venue. WOW! Wow. Great shots. And I can’t believe how young/pretty she looks! I’ve only listened to her and somehow expected her to appear older.